Before I re-watched it anticipation of its 20th anniversary, I might have dismissed Speed as more tired commentary on L.A. traffic. In actuality, I was shocked at how honestly the film portrayed Los Angeles' transportation culture in 1994. Although it did perpetuate its fair share of transit myths: Like anyone could ever get up to 50 mph on the 10 during rush hour. Even though 75 percent of the film takes place on a freeway, and there are plenty of stereotypical quips, surprisingly, it's actually a movie about a suddenly multi-modal Los Angeles, portraying the realities of L.A. commuting—Hey, people do ride the bus! Hey, there is a subway! The film also sets the stage with relatively accurate depictions of our infrastructural aspirations in the early 90: from our unfinished freeway network, which they actually shot on the yet-to-open 105, to a peek at our nascent subway system—yes, it was the first on-camera appearance for the downtown-to-Hollywood Red Line, which opened in 1993. Add the star-making turns for Sandra Bullock and Keanu Reeves, plus appearances by future Will McAvoy and Cameron from Ferris Bueller, all using bad dialogue that was apparently written by a young Joss Whedon (if you don't recall, the lines are being tweeted, one by one, at the Twitter account @Speed_1994). Now throw in buses, helicopters, a train busting to the surface on Hollywood Boulevard. It's kind of the quintessential L.A. mobility movie. 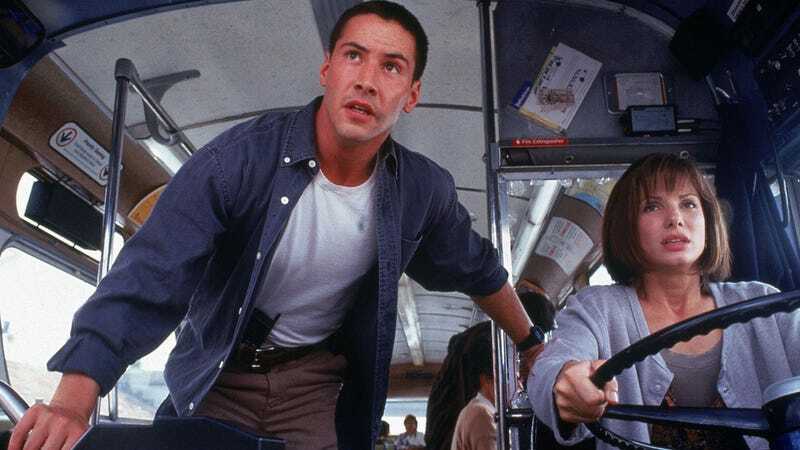 But I'd also say that Speed—released on this day in 1994—captured a far more important transportation moment for Los Angeles: The moment we realized the most dramatic, nail-biting entertainment could be found in the speeding vehicles on our freeways. Remember the rules imposed by Dennis Hopper, who has some weird vendetta against Keanu for ruining his plan to drop an elevator from the top of the Gas Company Tower? The bus's speed cannot drop below 50 mph, and none of the passengers are allowed to get off (although he makes an exception for an injured bus driver). The LAPD wants to unload the passengers onto a truck, come on, how would Dennis Hopper know? But Keanu protests: Dennis Hopper keeps giving him orders, and he seems to know exactly what's going on. How? Because of all the news helicopters swarming above—the goddamn media! Cut to a scene of Dennis Hopper holding his Zack Morris phone to his ear with his opposite hand—I think he blew one thumb off but, what, is the other eardrum damaged, too?—as he stands before a wall of televisions in his downtown lair. "Interactive TV, Jack, it's the wave of the future!" In the end, the choppers are banished from the skies and the newscasters become an unlikely ally. Keanu discovers a closed-circuit TV camera on the bus that was planted by Dennis Hopper, which was actually the way he was monitoring his progress. He comes up with a brilliant idea to intercept the closed-circuit TV signal, broadcasting looping footage from inside the bus that makes it appear as if all the passengers are still onboard. All the local stations comply with the ruse, looping their own "live on-the-scene" footage of the bus making 50-mph laps at LAX. It takes Dennis Hopper awhile to figure it out, and buys the LAPD enough time to safely offload everyone, then crash the bus into a jet. Whoa. About a week later in 1994, with Speed still in theaters, L.A.—and the world—was treated to as close of a real-life version of the film as one could imagine: O.J. Simpson led the media on a two-hour, 35-mph freeway tour of Los Angeles. An estimated 95 million viewers worldwide tuned in to watch the chase, which was shown on all major networks plus CNN. At times, up to 20 helicopters were following the action, resulting in broadcast signals being mixed up and sent to the wrong stations—just like the intercepted CCTV signal! But LAPD didn't tell the crews to turn away their cameras, oh no. It was a ratings bonanza akin to the Super Bowl, with Domino's reporting record pizza sales. Speed had predicted our insatiable urge to watch.